This premium, custom wall art piece just might be the ideal gift for the die-hard San Diego Padres fan! 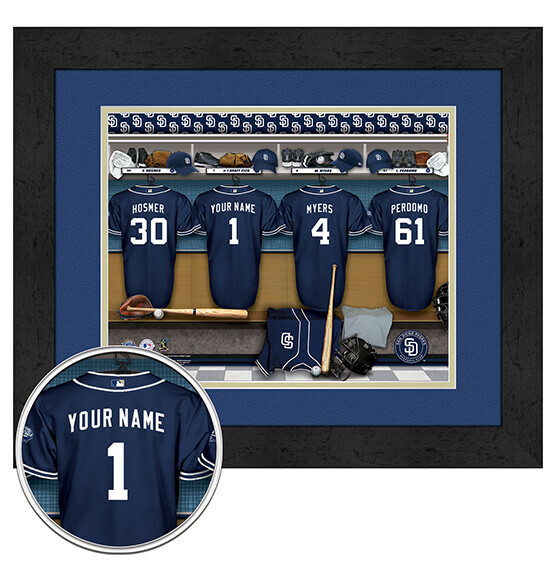 It's easy to personalize this San Diego Padres Personalized Framed Custom Wall Art: just tell us what name up to 12 characters that you want to add to the back of one of these four jerseys featured in this locker room scene. With its sleek design, MDF vinyl-wrapped frames, paper and glass, this is guaranteed to be an ultra-fine piece for any home, office or fan zone. It arrives with an included sawtooth hanger for easy mounting. Hit a home run with that special Pads fan in your life — purchase this personalized sports decor today!